Brand experts Modus asked to host a Tourism Branding Workshop at Worcester City Guild Hall. Worcester City Council is ramping up its efforts to entice more visitors to the city, with the creation of a new five-year tourism strategy and branding strategy. Tourism is estimated to be worth over £160 million to the local economy, and over 3,000 people are currently employed either directly or indirectly in Worcester’s tourism sector. There has been a substantial increase in the number of visitors to the city in recent years – up by 39.8% since 2000. The new Strategy, due to be published in the autumn, will set out a vision up to 2021 to address the needs of the visitor, the tourism industry, the community and the environment. It will outline the strategic aims and objectives for tourism in Worcester; set out the roles of the different stakeholders in the city’s tourism industry; and identify clear actions to be undertaken, to ensure Worcester achieves its potential growth in visitor numbers and spend. It will also provide an action plan to unite businesses, communities, the public sector, regional and national agencies to positively shape the development of Worcester’s tourism industry. The City Council is holding a tourism consultation event for over 50 local stakeholders on 13 July to help inform the strategy. Attendees include representatives from Worcester Cathedral, Worcester BID, Worcestershire County Council highways department and the City Council’s Cleaner and Greener team. 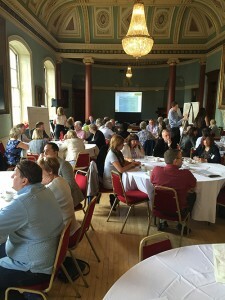 “Feedback from local stakeholders will be key to setting the future direction for Worcester’s tourism industry – it is essential that they are on board with any new proposals and are fully aware of innovations and developments which could have a positive impact on the city’s offering for visitors,” says Cllr Geoff Williams, Cabinet Member for Economic Prosperity and Growth. The new tourism strategy will also cross-reference key existing plans including the Local Transport Strategy, City Centre Masterplan and the South Worcestershire Development Plan. The tourism consultation event will also include a branding workshop hosted by Guy Marson from Modus Creative. Stakeholders will be asked a variety of questions including keywords to describe the City, as well as what they think are Worcester’s Unique Selling Points.